Pakistan: 'Collective Failure' Allowed Bin Laden To Hide : Parallels But the Pakistani government report also criticized the country's military and spy authorities for not being able to prevent the U.S. raid that killed al-Qaida's leader in May 2011. The confidential report was published Monday by Al Jazeera. 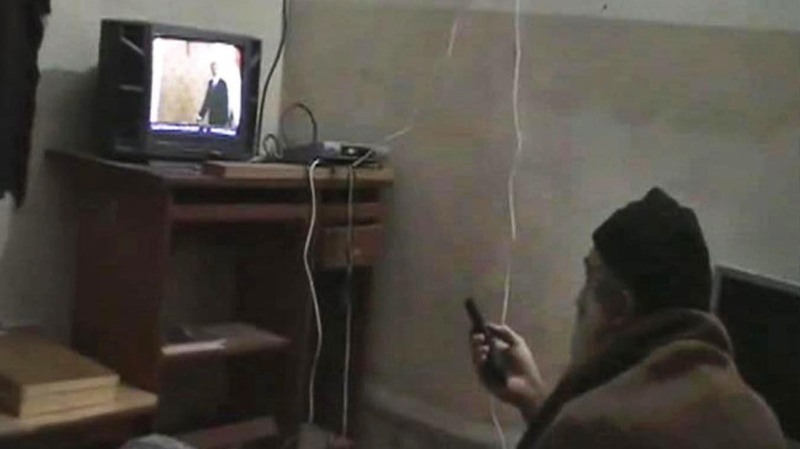 This undated image from video, seized from the walled compound of al-Qaida leader Osama bin Laden in Abbottabad, Pakistan, and released by the U.S. Department of Defense on May 7, 2011, shows bin Laden watching President Obama on television. The "collective failure" of Pakistan's military and spy authorities allowed al-Qaida leader Osama bin Laden to live in multiple places in the country for nearly a decade. That's the finding of a confidential Pakistani government report published Monday by Al Jazeera. The 336-page report said officials in the Pakistani government, military, intelligence and security agencies did not know that bin Laden lived in the country. But, the report adds, "the possibility of some such direct or indirect and 'plausibly deniable' support cannot be ruled out, at least, at some level outside formal structures of the intelligence establishment." The al-Qaida leader was killed in May 2011 during a Navy SEAL raid on his home in Abbotabad, an affluent area north of the Pakistani capital, Islamabad. His home was mere minutes from the Pakistani military academy. Bin Laden "was able to stay within the limits of Abbotabad Cantonment due to a collective failure of the military authorities, the intelligence authorities, the police and the civilian administration," the report says. "The failure included negligence and incompetence and at some undetermined level a grave complicity may or may not have [been] involved." Al Jazeera's investigative unit says the report outlined how "routine" incompetence at every level of the civil governance structure allowed bin Laden to move around the country. The report says in the years after the Sept. 11, 2001, attacks, bin Laden lived in South Waziristan, Bajaur, Peshawar, Swat, Haripur, Abbotabad and "possibly other places." It said members of his family lived in Karachi, Quetta and Iran. And in the wake of the raid that killed bin Laden, it emerged that Pakistani authorities were kept in the dark about the U.S. operation. "The report of the Abbottabad Commission, formed in June 2011 to probe the circumstances around the killing of Bin Laden by U.S. forces in a unilateral raid on the Pakistani city of Abbottabad, draws on testimony from over 200 witnesses, including members of Bin Laden's family, Pakistan's then-spy chief, senior ministers in the government and officials at every level of the military, bureaucracy and security services." Al Jazeera says the Pakistani government has suppressed the report. "The commission has also recommended a probe over the issuance of visas to a large number of U.S. contractors who established a spy network within Pakistan." Meanwhile, The Associated Press is reporting that Adm. William McRaven, the nation's top special operations commander, ordered military files about the raid that killed bin Laden to be "purged from Defense Department computers and sent to the CIA, where they could be more easily shielded from ever being made public."